After much experimenting with overlayfs in OpenWrt I've finally settled on a solution that works well. I have decided to call this project 'ovpkg' as in 'overlay package'. You can still use my old instructions if you have an ext2 partition on your card, but if you want to use a completely fat formatted card you can try out this new set of scripts. There seems to be a problem with the e2fsprogs package hosted at the chainxor.org repo that prevents these scripts from working. 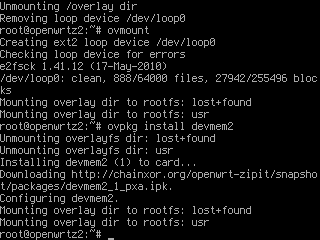 Install my e2fsprogs package instead of using the one from the repo (opkg install /path/to/downloaded/e2fsprogs_1.41.12-2_pxa.ipk). Now we are ready to mount the image file with the ovmount script. This script doesn't need any arguments, just type 'ovmount' and it does all the work. First it creates the image file loop device, t hen mounts the loop device to /overlay, then mounts the dirs in /overlay on top of the root dirs as overlayfs. You can also unmount the overlay with the uovmount script. This will install the software to /overlay (the image file) and remount the image so that all symbolic links show properly. If you want to install something to the jffs2 partition you can still use opkg as normal. To have OpenWrt automatically mount the overlay at boot or when the card is inserted you can replace a hotplug script with my modified version. The file /etc/hotplug.d/block/40-mount mounts all sd cards when inserted and my modified version will mount the overlay if it exists on the card. Be aware that at boot it does take a while for the card to be mounted. Your programs may not be available immediately at boot. I have also created an eject script that will unmount the overlays, remove the loop device and unmount the card. You should use this if you want to remove the card from the Zipit while booted. It's quicker than running uovmount and then unmounting the card manually.